The first weekend in August I took my first real holiday since being here. I actually took off the Friday and Monday - a first time request and went back down to the Capital. I was lucky enough to have grabbed a cheap return ticket for 90 bucks and even had a friend to take with me. It can't be said whether it was the unlikely, but amazing weather, the adventures we had, the friends we made, or just the fact that I was finally on a vacation, but it was one of the best trips I have ever had. We left first thing Friday morning and were picked up by a friend of a friend at the airport, a generous individual who was kind enough to show us around Mt Victoria, the water front, an art gallery,and offered his tour guide services again on Monday before returning us to the airport. Friday afternoon we had a leisurely lunch before checking into the hotel, working out, and hitting the town. A fabulous seafood dinner and a few drinks rounded out our evening in Wellington's CBD. Up bright and early on Saturday, we rented a car, picked up another au pair and drove out to the Southwest coast. Despite the twisty-turny "mountain" roads and the many hours of driving, the scenery and destination were more than worth it. We took a couple hour hike through the Pinnacles Track and over, around, and through a river. Then we went to Cape Palliser, the most southern point of the North Island, a light house, and the home to a large fur seal colony. I have now traveled literally from the top to the bottom of the North Island. Both the views from the lighthouse and visiting the lazy, but cute seal colony were spectacular, but did include a bit more exercise. Two-hundred and fifty stairs to be precise. Then it was back to the car for a few more hours of twisty-turny roads before stopping at Countdown (the grocery store) for dinner supplies. We were fortunate to have more generous and friendly people who had offered us lodging and the opportunity to meet some kindred Kiwis. Sunday, a group of us went out to the best brunch ever had. To be completely honest, in retrospect, we are not sure what made it so amazing other than we were all famished and the ambiance and food hit the spot. 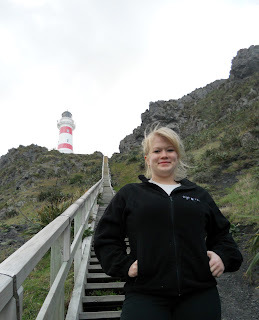 Then we were driven around Wellington, around all the bays, and to a beach walk called Red Rocks. A few more hours of immersing ourselves in New Zealand nature and beauty, another seal colony and we were back in town getting more dinner preparations. Monday we met up with some friends for lunch, toured Parliament, and spent our remaining hours wandering around Te Papa- the national museum.